Stellar Four: Summer Camp - NaNo Style! Summer Camp - NaNo Style! Most of us know NaNoWriMo from the annual November write-athon madness. You might have also tried their Script Frenzy in April. 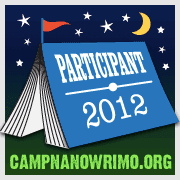 Last year, they added an additional writing event in August, the inaugural Camp NaNoWriMo. This year, Camp has spread to another month, with events in both June and August. Camp NaNo's goal is the same as the November one: write a 50K word novel in a month. Some try NaNo for the challenge, to start the novel they've "been meaning to get to," or just for the fun of writing with a bunch of other similarly focused individuals. Writing is a mostly solitary venture. Having a chance to interact with others on the cabin message boards, NaNo forums, Twitter, or local meetups can give a little extra boost as you try to reach your goal. Too hot to go outside or do anything remotely physical? Write! You'll probably be inside surfing the internet anyways. Traveling? Take your Work in Progress with you! When the person next to you on the plane asks you what you are doing, you get to say "Working on my novel." Camp NaNo has the added benefit of not happening a month before the holiday season. Are you in? If so, before you grab your laptop, hop on the bus and meet your cabinmates, here's a checklist of some other things to bring as well as some inspiration in case you get a little "blocked" along the way. -notebook/pens: sure, at some point you need to type it in, but notebooks can go anywhere and never run out of batteries. Just a thought in case you want to take advantage of the summer weather and still get your words in. -inspirational music: have a certain tone you are shooting for? A song that captures a character? Load up on your favorites. -Official Camp Gear (considering a purchase here helps to fund more NaNo fun, you should check out this year's offerings). If you are so inclined, you can donate too. Chuck Wendig: Hilarious and a fountain of good writerly advice. -Write a letter to your characters. Apologize to your protagonist for destroying her/his life. Curse your villain. Send a mea culpa to the innocent villagers decimated by the zombie horde. -Try some flash fiction. Participate in a group one or start your own. Just a small scene, no more than 1K words (the shorter the better). Can be in the world of your novel or can be used to appease that pesky new idea that won't let go. -Re-write a scene from another character's POV. What would the villain see? The best friend? The anonymous bystander? An alien in space? How can this further screw up the life, um, amp up the tension for your protagonist? -Skip it. So you know you need to get from A to C, but B is giving you grief. You just don't have it worked out yet. It's OK to make a note like "Then something happens" and move on. You can always come back to it later. Do you have any tips for your fellow Campers? Don't worry about how good it is. That's my advice. The reason this challenge is so great is that it gets you part the hardest part, getting a big chunk of text out. You have to have a real story, a real chunk of narrative in front of you before you know if it's any good. Once it's out, then go back and play with it. The other piece of advice is for those who have a hard time with endings. Think about where your characters will be one year after the story ends. Five years. Ten. If you can't think of the ending, thing about what the story has done to them, the ending may come to you from that.